The discovery of what is essentially a 3D version of graphene – the 2D sheets of carbon through which electrons race at many times the speed at which they move through silicon - could lead to much faster transistors and far more compact hard drives. Researchers at Lawrence Berkeley National Laboratory have discovered that sodium bismuthate can exist as a form of quantum matter called a three-dimensional topological Dirac semi-metal (3DTDS). This is the first experimental confirmation of 3D Dirac fermions in the interior or bulk of a material, a novel state that was only recently proposed by theorists. "A 3DTDS is a natural three-dimensional counterpart to graphene with similar or even better mobility and velocity electrons," says Yulin Chen, a physicist with Berkeley Lab's Advanced Light Source (ALS) when he initiated the study that led to this discovery, and now with the University of Oxford. 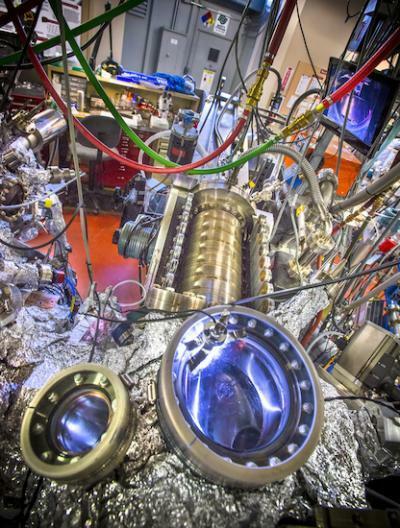 "Because of its 3D Dirac fermions in the bulk, a 3DTDS also features intriguing non-saturating linear magnetoresistance that can be orders of magnitude higher than the GMR materials now used in hard drives, and it opens the door to more efficient optical sensors." Zhongkai Liu, Bo Zhou, Yi Zhang, Zhijun Wang, Hongming Weng, Dharmalingam Prabhakaran, Sung-Kwan Mo, Zhi-Xun Shen, Zhong Fang, Xi Dai and Zahid Hussain. Two of the most exciting new materials in the world of high technology today are graphene and topological insulators, crystalline materials that are electrically insulating in the bulk but conducting on the surface. Both feature 2D Dirac fermions (fermions that aren't their own antiparticle), which give rise to extraordinary and highly coveted physical properties. Topological insulators also possess a unique electronic structure, in which bulk electrons behave like those in an insulator while surface electrons behave like those in graphene. "The swift development of graphene and topological insulators has raised questions as to whether there are 3D counterparts and other materials with unusual topology in their electronic structure," says Chen. "Our discovery answers both questions. In the sodium bismuthate we studied, the bulk conduction and valence bands touch only at discrete points and disperse linearly along all three momentum directions to form bulk 3D Dirac fermions. 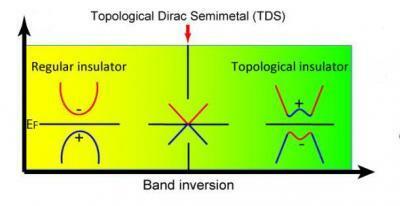 Furthermore, the topology of a 3DTSD electronic structure is also as unique as those of topological insulators." "ALS beamline 10.0.1 is perfect for exploring new materials, as it has a unique capability whereby the analyzer is moved rather than the sample for the ARPES measurement scans," Chen says. "This made our work much easier as the cleaved sample surface of our material sometimes has multiple facets, which makes the rotating-sample measurement schemes typically employed for ARPES measurements difficult to carry out." "A 3DTDS system could provide a significant improvement in efficiency in many applications over graphene because of its 3D volume," Chen says. "Also, preparing large-size atomically thin single domain graphene films is still a challenge. It could be easier to fabricate graphene-type devices for a wider range of applications from 3DTDS systems."